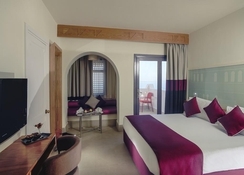 The Mercure Hurghada rests amongst 40 ha of landscaped gardens, nestled between the Red Sea and the endless Arabian desert. 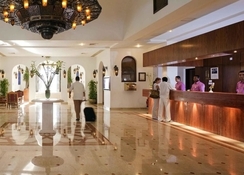 The hotel offers a wide range of leisure facilities - pleasing those who seek a beach holiday, or those wishing to explore the mysteries of the deep Red Sea by snorkel or SCUBA. 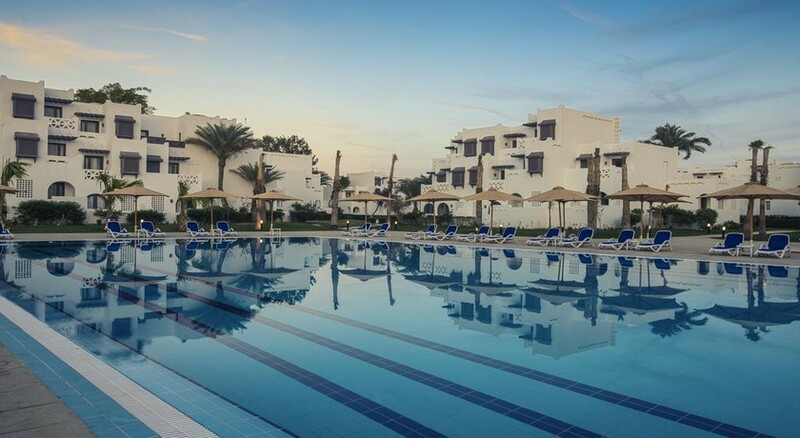 All this can be found only a 15 minute drive from the airport just south of Hurghada. Official rating of hotel is 4*. Leisure facilities at the Mercure Hurghada include: private beach, outdoor heated swimming pool, sun terrace with sun loungers and umbrellas, 3 restaurants, 1 cafe, 4 bars, disco, squash court, billiards, waterskiing, dive centre, windsurfing, Sofitel sport centre, clay tennis court, outdoor tennis courts, jogging track, fitness centre, hamam massage, sauna, Jacuzzi, gym, table tennis, pool table, live entertainment, open-air amphitheatre, gymnastics, aerobics class, laundry service, and a general store. 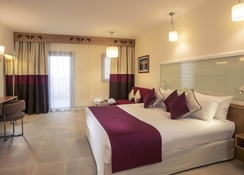 Each Mercure Hurghada guest room equipped with: private bathroom (with shower), air-conditioning, safe deposit box, mini-bar, satellite TV, radio, telephone, and either balcony or terrace (with view). Disabled facilities: ramps and lifts at the beach and public areas; wheel chair/supporting sticks are also available. We hereby informed that starting with 01.05.2018 Mercure Hurghada Resort will start renovation of one of the 3 swimming pools. The works area will be isolated for the minimum disturbance of the guests. The works might last until end of July 2018. The above errata is extented until 30.09.2018. Stayed here to windsurf. Did not disappoint. Awesome location and awesome staff. Only 10 minutes from airport. Egyptian people are lovely and do not deserve the bad press. Excellent hotel. Exceptional service and fantastic food. Would definitely go again. The hotel is lovely as is the location.. and the staff are so friendly and welcoming.. now for the not safe nice bits .. my biggest issue was the family room .. on booking I told teletext hols it was for my daughters 18th birthday and they reccomend the family room for my 2 daughters the family room was advised it was 2 adjoining rooms and a shared bathroom.. what it actually was a king size room with a small room .. literally had a bunk bed which was child size .. so I ended up arguing with recoprion staff .. and they couldn’t change the rooms .. so my daughter spent 10 nights on a pull out bed in the main room ( and it was her 18th!) and the cocktails were not all included in the fully inclusive .. you had to pay extra for a mojito but beer and cheap vodka were readily available .. WiFi was also poor and only available in some places in the hotel like the lobby but poor if the lobby was busy.